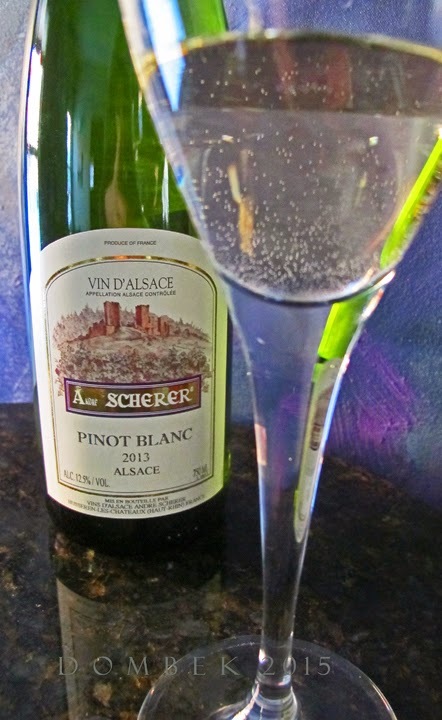 Pale lemon gold in color, with trace soft minerals on the nose, slightly more forward on the palate. Soft, creamy mouth feel. Salinity. Silky. Juicy, luscious clean fruit emerges. Limestone, minerals, shale ... while subtle waves of meyer lemon and lemon chiffon spill over the tongue. Restraint and delivery toute ensemble. Completely delightful and engaging, this wine expresses subtle intricacies and precision with ease and simplicity. The perfect manifestation of a desire for Spring! Under $13/bottle, exclusively at The Farm Stand, South Portland (while supply lasts). Enjoy with an organic pork chop from their excellent butcher shop, asparagus and risotto, par exemple! Domaine André Scherer is located in Husseren-les-Château, a commune in the Haut-Rhin region of Alsace, in northeastern France. The village runs along "La Route des Vins d'Alsace", a beautifully scenic area of vineyards in the vicinity of the Vosges Mountains. Christopher Scherer, taking over from his father André (8th generation winemaker), is bringing rapt attention to the domaine. After wine study in Burgundy, Bordeaux and Australia, he took over the family estate in the 1990's. He presently works entirely with oak for his fermentations, using large tonneau for Pinot Blanc. One tastes the finesse in a glass! Available presently through Wicked Wines, Bangor, ME. A Peter WEYGANDT Selection, Imported by Weygandt-Metzler, Unionville, PA.